There was nothing surprising about men turning up dead in the Second City. Life was cheaper than a quart of illicit gin in the gangland capital of the world. But two murders that spring were special - worthy of celebration. So believed Maurine Watkins, a wanna-be playwright and a "girl reporter" for the Chicago Tribune, the city's "hanging paper." Newspaperwomen were supposed to write about clubs, cooking and clothes, but the intrepid Miss Watkins, a minister's daughter from a small town, zeroed in on murderers instead. Looking for subjects to turn into a play, she would make "Stylish Belva" Gaertner and "Beautiful Beulah" Annan - both of whom had brazenly shot down their lovers - the talk of the town. Love-struck men sent flowers to the jail and newly emancipated women sent impassioned letters to the newspapers. Soon more than a dozen women preened and strutted on "Murderesses' Row" as they awaited trial, desperate for the same attention that was being lavished on Maurine Watkins's favorites. 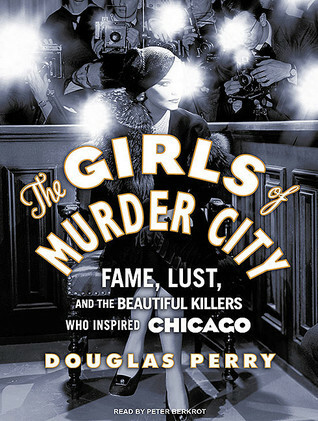 In the tradition of Erik Larson's The Devil in the White City and Karen Abbott's Sin in the Second City, Douglas Perry vividly captures Jazz Age Chicago and the sensationalized circus atmosphere that gave rise to the concept of the celebrity criminal. Fueled by rich period detail and enlivened by a cast of characters who seemed destined for the stage, The Girls of Murder City is crackling social history that simultaneously presents the freewheeling spirit of the age and its sober repercussions. Why Did I Listen To The Girls of Murder City by Douglas Perry? A long time ago, Hannah at So Obsessed With posted a review of The Girls Of Murder City by Douglas Perry which convinced me to buy the book – and I went for audio because that’s the easiest way for me to get in some non-fiction. I felt like a hard boiled non-fiction book about murderesses would be just the ticket for me and an apt sort of listen after completing the audiobook of The Murder of The Century. It would seem I am on quite a roll with all these murder-themed non-fiction books as of late. Raise your hand if you’ve seen the movie Chicago. I think we all saw that movie in the early 2000s. The Girls Of Murder City by Douglas Perry is about the events that the movie is based around. It is about a time in Chicago when women were murdering their husbands and getting away with it if they were beautiful and of the right sort of class. It is about all male juries and how biased they were toward pretty women. It is about two female journalists, Maurine Watkins and Ione Quimby. The majority of the story is about the sensational trials of Beulah Annan and Belva Gaertner – two gorgeous women who murdered and basically held the nation captive with their trials. Yo, if you want to read non fiction and that is a goal of yours to branch out, try this book. The Girls Of Murder City by Douglas Perry reads like narrative non fiction. It remains fascinating the whole time and draws together different elements of a time of corruption in the Chicago legal system and sexism to draw such a vivid real life story. I mean, it amazes me that a movie which captured my attention as a teenager was based on actual events. I had no idea how much of Chicago was drawn from real life. Also? I loved how much of this book is focused on women. There is one section on this murder of a fourteen year old heir that was centered on men which felt a bit off, but I believe it was included to highlight more of Maurine Watkins career. The Girls Of Murder City by Douglas Perry narrated by Peter Berkrot is the perfect commute audiobook. Granted, I think that is more due to the writing than it is due to the narration. I really thought that Tantor Audio made a bad decision when choosing a man to narrate a book that is essentially about women. I think this audiobook would have been much more effective had it been narrated by a woman, like maybe Julia Whelan. I’ll admit that Berkrot does have a hard boiled sort of voice and he does a decent job with different voice. Still, it kept taking me out of the story and I did spend a lot of my drive pondering sexism in the audiobook industry and why a book by a man can’t be narrated by a woman and well, when you drive three hours a day, you have a lot of time to think about these kinds of things.